Other Products by PrimaForce. Search other Amino Acids products. 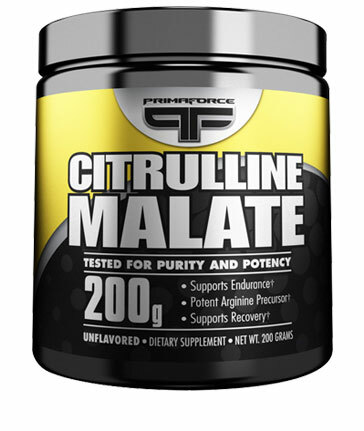 PrimaForce Citrulline Malate has been demonstrated to increase lean mass and performance gains. Citrulline Malate also supports increases in blood flow and amino acid delivery to skeletal muscle, leading to improved protein synthesis (muscle growth), enhanced ATP production and cell volumization. PrimaForce Citrulline Malate has the potential to both increase muscle growth and spare muscle by making Leucine and other branched chain amino acids more effective. Consume 1-3 servings of Citrulline Malate before and during exercise. Pwoahhh what a pre-workout! Buzzing like no tomorrow and got a super intense pump from it.